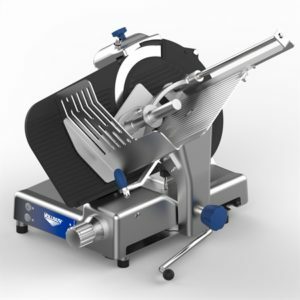 Designed for high-volume retail operations, the Heavy Duty Deli Electric Slicer from Vollrath is belt driven, durable, and uses a long-wearing belt to provide reliable service. It includes a built-in sharpener, to keep operations running smooth and production consistent. ½ peak HP heavy-duty motor for continuous use and higher torque is used for cheese slicing. Cleanup is easy! A kickstand can be used to easily and safely clean under the slicer. A carriage tray tilts open with zero blade exposure for safety and easy cleaning. Proprietary non-stick coating reduces drag and makes the slicer easier to clean.